When Bellator announced it would hold an eight-man heavyweight tournament that harken back to the glory days of Pride FC, one name popped out: Matt Mitrione. The man known as "Meathead" is 3-0 since signing with Bellator back in March 2016 with all wins coming via knockout with his most recent over the living legend: Fedor Emelianenko. The Heavyweight Grand Prix is Mitrione's chance not only to seize Bellator's vacant heavyweight title but establish himself as one of MMA's premier heavyweights. Mitrione was one of Bellator's best signing as the former NFL defensive tackle is a physical specimen. At 6'3" 254 lbs, Mitrione is quick and explosive and he is younger than his legal age of 39 as he only started competing at 31. Already holding a win over Emelianenko, few other fighters in the tournament have the right combination of size and skills Meathead possesses and at +225 to win it all, this is a solid value. 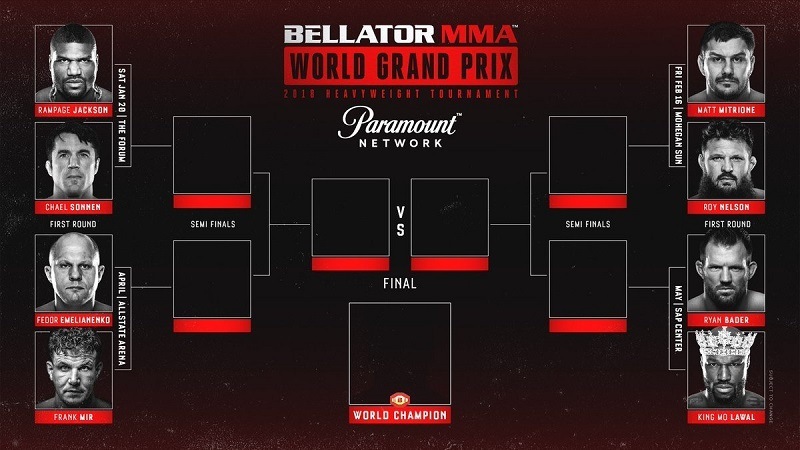 The Grand Prix is set to begin on January 20, 2018, the date of Bellator's first event of the year: Bellator 192 headlined by a welterweight championship bout between champion Douglas Lima and former UFC title challenger, Rory Macdonald, Canada's best current active MMA fighter. We examine the four bouts currently scheduled. All betting odds via Bodog. In terms of popularity, this is the biggest matchup in the tournament. Both Jackson and Sonnen have established fanbases and are vocal enough to sell any fight. This is likely why Bellator matched them together as it guarantees one of them moves on to the next round. In terms of the matchup, this slightly favours Sonnen as Jackson is vulnerable to wrestlers and isn't much bigger than Sonnen. A battle of two heavyweight legends who are on their last legs. Mir, the former UFC heavyweight champion, and Emelianenko, the former Pride heavyweight champion still have one thing going for them: power. On paper, this is a grappler (Mir) versus striker (Emelianenko) match though it will likely end with a knockout. Mir gets a slight edge here as Emelianenko is just about one punch away from calling it quits again. Whoever wins this bout could go on to win the whole thing and that favours Mitrione. Though they are only separated by two years, Mitrione is a lot fresher than Nelson, who has absorbed a hellacious amount of damage thanks to his fighting style. Nelson always the chance to land a big overhand and put Mitrione away but Mitrione is a much better striker and will be the significantly bigger man. An underrated bout on the card; Bellator matched two original light heavyweight wrestlers in hopes they cancel each other out and "stand and bang". Bader is the current light heavyweight champion but has never fought at heavyweight in his pro career. Lawal is 6-1 as a heavyweight in recent years with wins over natural heavyweights like Cheick Kongo and Satoshi Ishii. However, Bader is the better fighter and should win. Mitrione leads the pack at +225 followed by Bader at +280. Both men could go head-to-head in the semifinals as they're both on the same side of the bracket. Mir at +400 is the favourite from the other side of the bracket. Barring injuries, Mitrione would beat every fighter on the list. Sonnen has some value at +1400 as his path to the finals is a lot easier than Mitrione or Bader. An MMA tournament is the toughest tournament of any sport thanks to its gruelling nature. Injuries happen often and it won't be a surprise if we see an alternate fighting in the finals. A bet on an alternate fighter to win the tournament is only slated at +600. No official alternates have been named but legitimate heavyweights like Cheick Kongo and Augusto Sakai are available. Bellator has long been a distant second to the UFC in terms of MMA promotions but the last three years have seen them grow significantly. In signing top-tier talent like Macdonald and Mitrione, Bellator gives both fans and bettors a valid second-option to the UFC. Canadians can head to online sportsbooks to bet on Bellator fights while using the many signup offers.